The speed of the hard disk is composed of various factors including load, drivers, operating system and the data bus. First, you should check all the drivers are installed correctly, this should at the same time take a look at all drivers. Not only that of the hard disk ► Starting the Device Manager under Windows! Very useful is also the hard disk optimization with the SSD hard disks this is possible. ► Defragment in Windows 8.1 / 8 and 10 (hard disks, optimization)! You can get more disk space by listening to more memory, because the computer has to outsource less to the hard drive, or by moving the virtual memory to a separate hard drive, the load of accesses is split between two hard drives. ► Customizing the pagefile.sys paging file in Windows 8.1 and 10! Oh yes, by switching or updating to the New Windows 10 , can lead to success, but of course you have some changes here. Enable or Disable ► the auto driver updates on Windows 10! ► Where can I find the Autoupdate settings in Windows 10? ► Starting the Device Manager under Windows! ► Change my documents folder in Windows 10! ► Show drives in Windows 10! ► Performance Index in Windows 10 Experience Index! 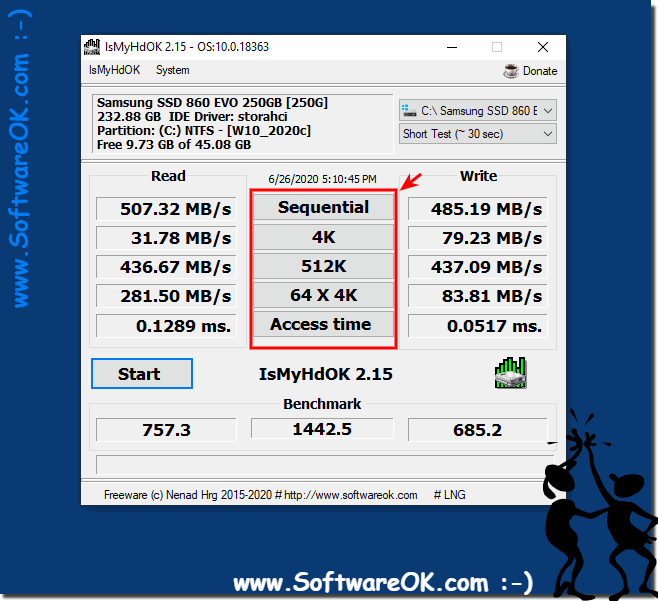 ► ... the IsMyHdOK, SSDs or HDDs benchmark points! (Image-1) Iindividual test values or measurements in IsMyHdOK! A hard disk is a mechanical device with a relatively high speed for daily work such as Windows 10. However, due to certain factors, it may lose some speed, resulting in slower booting of programs. It is also noticeable when opening and saving larger files. All the work on the computer becomes uncomfortable and sluggish. In any case, you should do a number of actions to increase the speed of your hard drive, which will allow you to significantly increase the performance of the entire operating system. First, you should check all the drivers are installed correctly, this should at the same time take a look at all drivers. Not only that of the hard disk, these can also have an indirect effect on the hard disk speed. It does not matter if this is an SSD or HDD. In Device Manager, an important part of Windows 10 and 8, you will find information about installing and configuring the computer hardware and drivers. Very useful is also the hard disk optimization with the SSD hard disks this is possible. Before you defragment the disk, you should ask yourself what you expect and how full the disk is. Because the entire defragmentation can take some time and does not always bring the desired success with it: ► Defragment or Optimize! When one or more factors affect the operation of the hard disk, it starts to work more slowly, which is noticeable to the user. To increase the speed, you can use the simplest method of systemization, the so-called Windows Auto Update which usually ensures that all drivers are up to date. IsMyHdOK - FAQ-6: How do I increase the speed of the HDD (SSD / HD)?